Not often you see a Formula One car in Monaco, except during the Grand Prix of course. Here's a very special one. 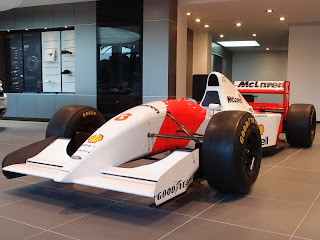 This is Ayrton Senna's McLaren in which he won the 1993 Monaco Grand Prix. It's on display in the new McLaren showroom on Avenue Princesse Grace. I photographed it through the window, hence the reflection of palms and then saw the door was open so was able to get up close and personal. The use of black and white was a good technique to lessen what might have been a distraction of the reflection. I will try that myself in the future. Nice wheels, Jilly! Did you convince anyone to let you take it out for a spin around the principality?! Such a historic f1 car, Prost vs Senna affair and everything about it. Great shot! 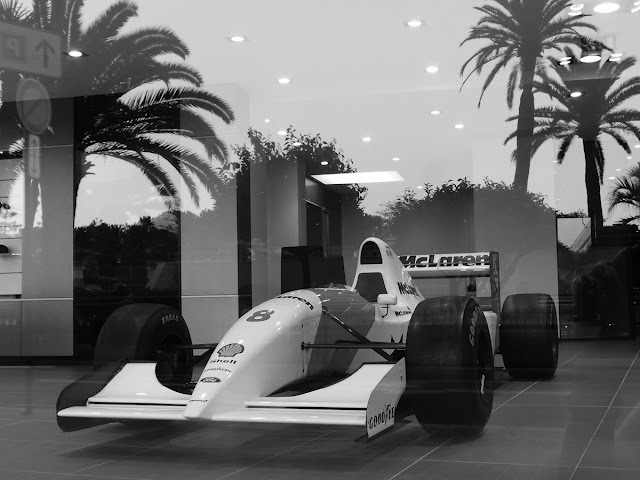 Was it up for sale, or just there to attract customers into the showroom? Valladoid, thanks for that info. Makes it even more fascinating. Gailsman, I don't know if it's for sale but I doubt it, especially reading the history of the car in the previous comment.